California tastes are as varied as the state’s geography and culture, so you’ll want a custom awning from Sunesta for your distinctive home in the Golden State. We take precise measurements so we can custom-manufacture an awning to fit just about any space – large or small – that you can imagine, including windows, doors, patios, pool decks, pergolas and other free-standing shelters, as well as skylights. We offer our durable, fade-resistant synthetic fabric in more than 150 colors and patterns, so you’re sure to find a look that suits your tastes and complements your home. You can also get our sturdy metal frames in a choice of colors. 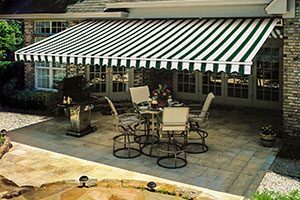 We carry an impressive array of awning accessories, including remote control options for motorized retractable awnings, dropdown screens that are also known as retractable walls, and lighting and heating units that can make outdoor living a pleasure, day or night, and in any season. What’s more, we keep up with your preferences and custom order details with our exclusive SmartCode‚Ñ¢ identification system, so that we can refer to your previous orders quickly and provide customized service on demand. For more information about a top-quality, custom-manufactured Sunesta Awning and accessories for your California home, call 1-800-SUNESTA today.